Imagine yourself, a new herbal professional just getting started with clients and you suddenly can’t recall which herb pairs with milk thistle to support the liver, or you are finishing up with one client and have another one waiting and you know the name of the herb you want to use but it slips your mind with the added pressure of knowing someone is waiting for you. What do you do? What is available to help you quickly browse through the actions of the herbs in your apothecary? Oh yes of course, grab the Herbal Quick Reference! This is YOUR Herbal Reference List! It is a project intended for each Genesis School of Natural Health student to begin thinking about in Phase One, actively start working on in Phase Two, and finish up prior to the completion of studies. As you are progressing through your courses some herbs will “POP” out at you. Perhaps you are already using or interested in a few. Begin the project by writing down their common name. Next you will want to collect the binomial names of the herb you want to study. The binomial name is a Latin name used for scientific plant identification. It is broken down into two-parts, the first is a general name called the “genus”. This name can be shared by a number of plants. The second name is called the “species”. This refers to the individual plant. When written, the binomial names are usually italicized the genus being capitalized and the species all lower case. You will then want to add the primary action(s) of the herb in parenthesis. The action of an herb is the job that it does in the body. An herb that is alterative is supportive of homeostasis. Alteratives will help restore proper function, elimination of waste, and restore health and vitality. If you don’t know the herbal action right away, don’t worry, you can fill it in later. As you progress through your studies you will have access to materials that provide this information. Next you will want to add the temperature and taste of the herb after the herbal action in parenthesis. Remember, the nature (temperature) and taste of herbs are not separate properties but are both considered together when selecting herbs. 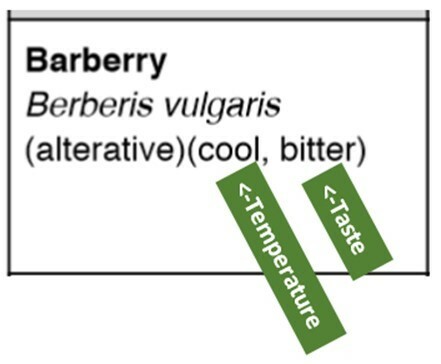 There are seven tastes—sweet, salty, astringent, sour (which can also be astringent), bitter, acrid (sometimes referred to as pungent or spicy), and bland (which in TCM doesn’t mean without taste, rather it means natural, unspoiled, or pure.) The taste of an herb is an important indicator of its action in the body. Bitter tastes, for instance, have been known to affect appetite, weight loss, and digestion for thousands of years. However, the bitter must be tasted to be effective. It is the body’s response to the bitter taste of the herb that triggers the the secretion of digestive enzymes in the upper abdomen, aiding digestion. Another wonderful herb for circulation is Cayenne. However, the stimulation of the circulatory system begins with the taste of the herb. Taste! One of our five physical senses that has been “under-understood” in terms of health in our modern culture. Here is where you get to list the amazing things that the herb can do. It is difficult (believe me) to keep this concise, but you will need to for your useful, easy-to-read “quick” reference. Don’t worry, you will have your reference library and ‘Google’ to fall back on when further study is needed. Now for those of you on the other extreme, the example here has a good amount of informative text, stretch yourself! Be sure to add herbs under each of the Body System headings listed on page 2 of the Herbal Reference Project guidelines accessed in the Student Portal. 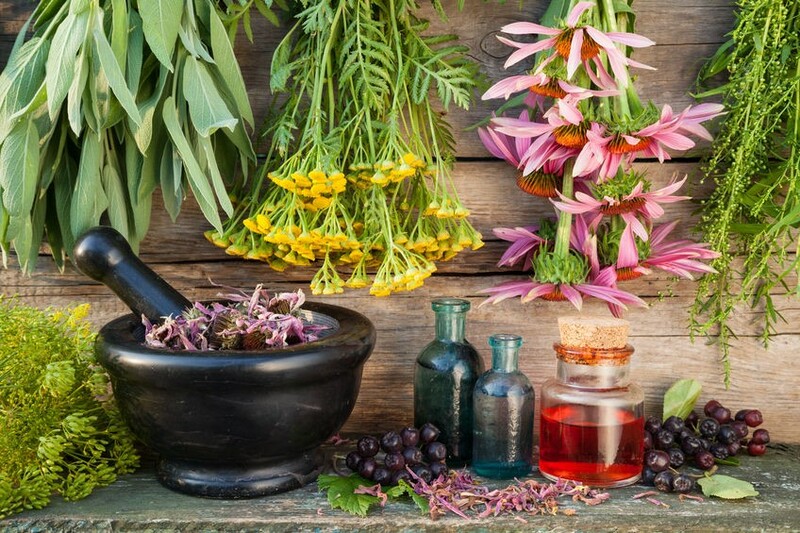 You will want to create a well-rounded list for your apothecary containing herbs that offer support to all the body systems and also remedies for many common illnesses. Please go ahead and include the herbs and text listed in the Herbal Reference Project guide. They are there as examples for you and are also recommended, commonly used herbs that you will need to know and want to use. This alone will get you off to a good start on your project! Use a spreadsheet program similar to Excel or Numbers, or create a table in a Word-type document. Use a clear, easy-to-read text and add bold highlights to things you really want to catch your attention, like the common name of each herb. Don’t include too many herbs to start this project. Remember, you won’t be starting out with 200+ herbs in your apothecary. Maybe someday it will grow to that, but certainly not in the beginning of your career. Don’t make the project a bigger deal than what it is. I wasted so much time trying to include every herb and every bit of information I could find, that I completely missed the point about it being a “quick” reference. I submitted my scaled-down version in the end and that was still way over-the-top! Use the herbs listed in the Herbal Reference Project guide (located in the Student Portal.) Think of it as a ‘freebie’ to get you started!